In a room just above St.Stephens Green, there lies an alien universe. Brian Eno’s 77 million paintings exhibition is currently on show in the Gallagher Gallery at R.H.A and it is a completely extraordinary sight. At the top of a dark room there is a 20 foot stain glass window that is constantly changing and reshaping into different patterns . The designs are composed of 296 paintings made by the world famous music producer. Brian Eno painted them on to glass where they are now projected onto a wall. It is fed through a software that constantly splices them together and changes their shape. The exhibition is named after the 77 million possible combinations that the paintings can make up. In typical Eno fashion he has composed a soundtrack along with the visual arts piece. The godfather of ambient music has composed a series of deep bases, natural sound effects and airy vocals which is played in accompaniment with the ever changing ocular scene. The ambient music draws you into the room and you can easily find yourself losing track of time in the immersive experience. 77 million paintings is an example of generative art. This is art that has been created in part or in whole by something that is not human. 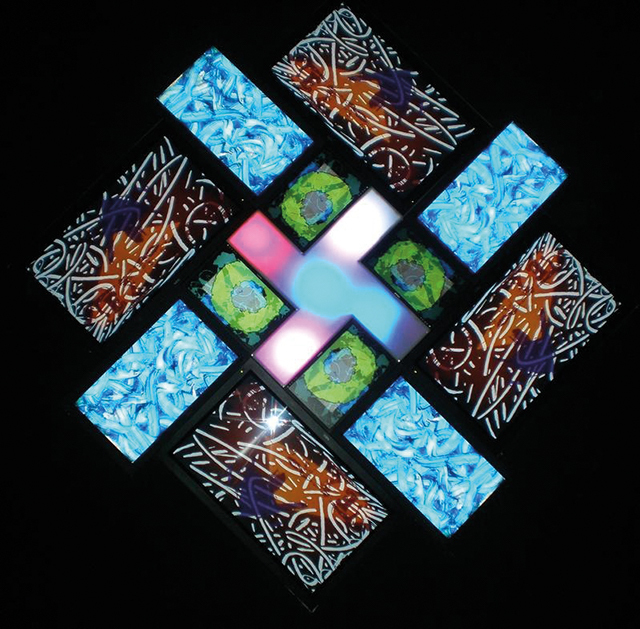 Brian Eno fed his paintings in a software and the computer displays it’s own version of art. Each city that it is showcased has its own unique viewing because no screening is identical due to the software’s randomisation. A simpler example of generative art is wind chimes. A human has made the chimes but it is the wind that creates the music. Eno uses generative art to interpret his understanding of natural processes. Natural processes being orders in nature, such as photosynthesis , that create complex and unpredictable results such as plant life. This is reflected in the art piece where the software follows orders or algorithms to create unpredictable results, in this case one of 77 million art pieces. It is quite a spectacular sight to see this complex idea being physically created right in front of your eyes before morphing into something completely new. Nature is a prominent feature in the exhibition. As you walk into the room there is willow tree trunks that sprout up from the ground and stretch into the ceiling. Also scattered around the room are piles of sand that change colour randomly from the lights that shine above them. The natural setting of the room provides a powerful contrast to the electronic centre piece. It is a physical representation of ‘ algorithms ’ or orders of our world that produce nature and art. The multi award winning composer studied both art and music in Ipswich. It was with difficulty that Eno picked music over art to focus on. However, all these years later he has combined his two passions with the 77 million paintings exhibition. The piece was first exhibited in Tokyo in 2006 but has since travelled the world. In 2009 the art piece was projected onto the Sydney Opera House exterior and now it is on show for free in Dublin until February 24th. The artist is often described as one of the most influential figures in modern day music. His collaborations in his career are filled with the biggest name in music such as David Bowie, The Talking Head’s David Byrne, Gorrilaz’s Damien Alburn and Jon Hopkins. He has co-produced some of the most important albums of the last half century such as U2’s ‘The Joshua Tree’ and Coldplay’s ‘Viva La Vida’.